Good things come in small packages, or so we're told. This may be true for die shrinks equalling higher clock speeds, but when a whole PC is shrunk down to something smaller than a regular optical drive, something has to give, surely? As far as specs go, Zotac's latest mini marvel certainly seems to be punching above its weight. At the its heart beats an Ivy Bridge Core i7 CPU - not some wheezy i3, Celeron or Atom. It isn't quite the speed demon you might be hoping for though: this i7-3537U chip is only a 2.0GHz dual-core part, albeit with a max Turbo clock of up to 3.1GHz. It's in here primarily for its low 17w TDP, so it doesn't get too hot under the collar in such confined surroundings. It should have sufficient oomph to power through most scenarios though, especially backed up by 4GB of speedy DDR3 RAM. Zotac has also packed in a proper 2.5-inch 500GB HDD, which makes it even more impressive that everything's nestled into a part-aluminium, part-plastic chassis measuring just 127mm/5in square and 45mm/1.75in thick. It's not as if it's skimped on connectivity either. Around the back you'll find four USB 3.0 ports and an eSATA socket, alongside Ethernet, HDMI and DisplayPort connections. Up front are a pair of USB 2.0 ports, headphone and mic outlets, and a seven-in-one card reader. There's even on-board Wi-Fi thrown in. Fire up this micro machine and general performance outstrips what you'd imagine possible from such a tiny design. Its CPU rendering and x264 encoding speed aren't exactly blistering, but the scores translate to nippy real world performance in most programs. Intel's HD 4000 graphics engine also breezed through Full HD video playback and managed borderline-playable performance in Grid 2 with medium detail at 720p. The storage space is where the Zbox Nano feels the strain. That 5,400rpm HDD chugging away inside makes a right meal of program loading compared to a snappy SSD. If you'd rather have something faster, we'd recommend going for the barebones version of the ID6. While you're at it, you'd be wise to grab an 8GB RAM stick for the single SO-DIMM slot. But storage slip-ups aren't the biggest issue here. Reduced size doesn't mean reduced price, this is one pricey piece of kit. Even a mini-ITX setup for the same money would probably be faster and more upgradable. Sure, the Zbox Nano would deliver the goods as a media center in your living room thanks to its flawless full HD video capabilities and remote-ready IR sensor. But if that's all you want, why not splash the same cash on a smart TV and a more capacious external hard disk, or just hook up a multimedia drive to your existing telly for a fraction of the cost? Realistically the Nano has to sell itself on size alone. 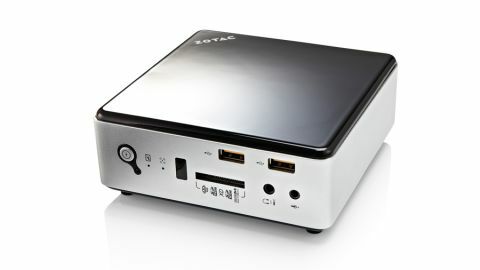 If you must have something this tiny and don't mind paying through the nose for it, Zotac has proved that it's possible to shrink the PC without shrinking its feature set or performance.